Two leaves and a bud are plucked from the high mountain tea plantations in Yunnan province China. Following natural withering the tea is sun dried. After drying, the tea is piled onto a large table for sorting. 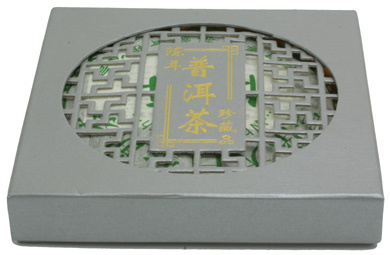 In the next stage the tea is steamed once again to make it soft and pliable for the forming stage. 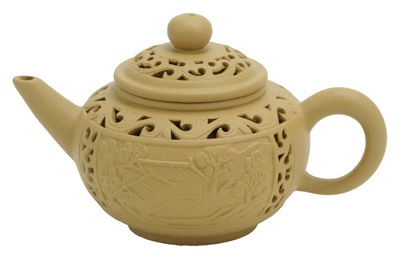 About 400g of lightly dampen tea is specially formed under pressure. It is then placed on racks and dried during the next 5 to 7 days at 45C. The internal moisture in the tea continues to ferment adding depth and body to the already distinctive character. A knife is needed to pry large horizontal flakes of tea off the cake for brewing. 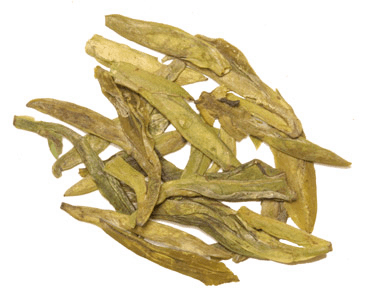 When brewed this tea produces a bright yellowish infusion with floral aroma and sweet mellow dry taste. Doctors in Kunming reported that drinking this tea helps to lower cholesterol levels in the blood stream remarkably. This tea with slimming benefits also helps with digestion. 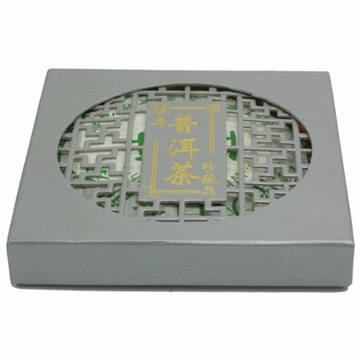 The Puerh pie is nicely package in a gift box and is a great gift for someone looking for a tea delicacy. Free shipping with purchase over $60. I really enjoy this tea. I cut up the cake into small pieces and keep them in air tight jars to keep them fresh & easier to prepare each morning. I use a Teavana Perfectea Maker , 16oz and add boiling water, enough to cover the tea...count to 10 and rinse it out. Then, I add more boiling water, let it sit for only about a minute so it doesnt turn bitter. I add about 10 drops of clear stevia and it is perfect every single time. This tea is subtle with a hint of honey, I love it.